Precisely wash 300 g of chanterelle mushrooms. Cut bottom parts of stem if dirty. Throw it all onto frying pan and gently heat to remowe excess of water. After few minutes, when mushrooms are no longer wet, add some butter or lard and gently fry (I do prefer lard, see photo below). 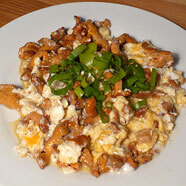 I usually fry chanterelle mushrooms for 15 minutes. During that time it becomes golden. Such mushroom is a bit gristly, what I actually like :) If you fry a bit longer, chanterelle becomes brown and has more 'meaty' consistency. 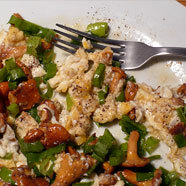 Add 8 eggs and fry. Sprinkle or mix with chives. Serve with bread or rolls.